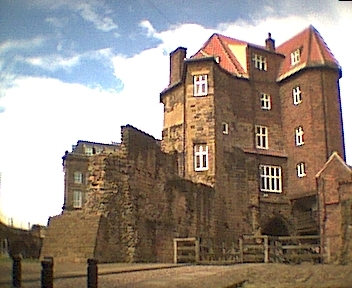 The Castle Keep is located in Newcastle city centre (near the Bigg Market) and is the oldest building in the city. My mate Andy visited the castle a couple of weeks earlier and found the castle rather unusual, research into the castle reveals that the castle is rumoured to be haunted, so armed with my camera I decided to go and check it out. The City of Newcastle got its name from the “new castle” founded in 1080 by Robert Curthouse, eldest son of William the Conqueror to guard to lowest bridging point across the Tyne. He chose for its site the Anglo-Saxon cemetery of the settlement of Monkchester. The cemetery was not, however, the earliest use of this area, the graves being found dug into the ruined walls and metalled road of the Roman fort of Pons Aelius. Upon arriving Andy and I checked out the Black Gate, which is separate from the Castle Keep. You can’t get into it but we had a good look around, checking out everything and taking a few photos. We climbed through a ruined wall and had a look at what was the external ditch (underneath the wooden bridge) this would have been one of many forms of protection for the gatehouse. We paid our entry fee when we arrived at the castle (£1.50 including a guide booklet) then took a thorough look around the castle. It looks small from the outside but when you get inside it is much bigger than first impressions would have you think. There are two sets of spiral staircases and many corridors so it’s easy to miss out places you haven’t seen and visit the same place two or three times. 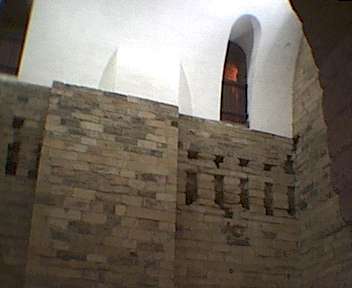 There is a fine late Norman chapel which has in it two gravestones, a vault (although the public aren’t allowed in it), a huge great hall, which has a gallery running around the top of the room, just below it is another set of corridors but the are inaccessible to the public, the Queens chamber, the interpretation room, and others. The room that interested me most, however, was the garrison room. The garrison room is said to be haunted by the spirit of a poppy girl. The gentleman we asked upon paying our money told us that Alan Robson claims that this ghost exists, although the man also told us that as far as he knows no one has ever seen her. The garrison room is a large room with a large stone pillar in the centre of the room, its cold and dark and a bit eerie. It also has a stone staircase leading to another room, but you can’t get in as there is a locked gate. We were alone in the room and we stayed in there for a while, standing silent, listening, looking, basically trying to pick up anything we could and unfortunately we didn’t experience anything. The place that Andy found creepy was the gallery running around the top of the great hall. 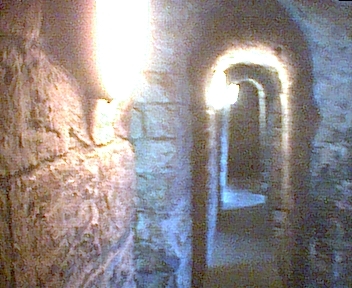 A dark series of corridors with balconies looking down on to the great hall. We spent a considerable amount of time wandering these corridors but never heard or saw anything, although it has to be said there is not quite right about the gallery. The castle is easily accessible, has a reasonably cheap entry fee, and best of all there aren’t many visitors so it’s easier to find a quiet room and stay in there on your own to see what happens. Well the castle certainly has a strange atmosphere about it, although I didn’t hear anything and I didn't smell or feel anything strange. I had high hopes for the garrison room, especially as we could get in there alone and it was very quiet, but no, nothing happened. I don’t know if there is any activity in Castle Keep, it certainly is an odd place, although with it being the oldest building in the whole of Newcastle there’s every chance of it being haunted. 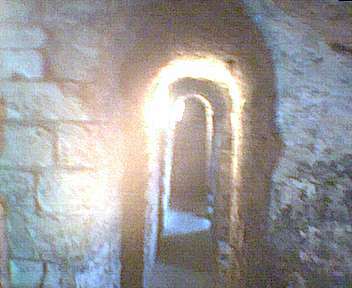 What I’ve decided to do is write a letter to The Society of Antiquaries who own the castle to see if it would be possible for me to stay in the castle overnight tooled up with a digital video camera, cameras, a tape recorder and such like and set up a few traps and see what happens. If they agree to it it’ll likely be either January or February 2003 so keep checking back to see if I get the green light to see what else Castle Keep has to offer. While in Newcastle with Andy and another mate, John we decided to pay an unplanned visit to the Castle. We spent about an hour walking around the castle spending a little while in each room, we didn’t experience anything out of the ordinary and since I didn’t know that we’d be going to the Castle I didn’t have my camera with me so I have no photos either. However, when we were leaving the Castle we got talking to one of the members of staff and found out that the reason some of the rooms are closed to the public is due to safety reasons. The rooms are unsafe and there are no handrails to hold when going up and down the stairs. We asked about ghosts and he went on to tell us that shadows have been seen in the gallery, he then told us about the poppy girl, and he also told us of a strange cloaked figure in a top hat that he had actually seen a few times himself, so it seems I was way off the mark when I said that there has been no reported sightings at the Castle. I still hope to stay overnight in the Castle and this new information has made me more confident of getting a result if I get the go ahead to start planning my ghost hunt at the Castle Keep.